Even though I don't watch anime, that got me intrested. What really catched my eye swordwise was that beautiful odachi. The girl in white actually has a hard job compared to other two in pics, holding sword like that in some of those poses and still looking pretty is tough combination. That's a great inspiring article. I did a little fencing while in high school and college, it was very amateurish, mostly for drama classes and such or fun. Then I graduated to messing SCA rattans but that tended to hurt a lot more. A stunning new show at the Wallace Collection, The Noble Art of the Sword explores the history of the sword in all its lethal beauty, says Richard Dorment . 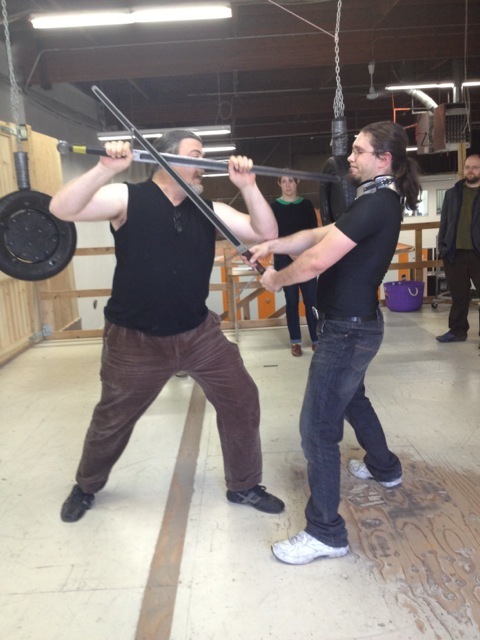 The Noble Art of the Sword has been timed to coincide with the Olympics. On selected Saturdays there will be demonstrations in historic fencing techniques as well as swashbuckling films, so do consider taking older children. And the compulsively readable catalogue is packed with new and mostly unpublished material. Although he grew up in San Francisco watching “too many” samurai movies during the 1960s, Michael Bell was well on his way to becoming a professional musician when he found life quite literally cutting him a new path: The Californian has spent the last four decades making exquisitely crafted Japanese swords. MONTREAL - Lacquered in gold, the armour of the noble samurai Edo glistens in the spotlight. His imposing helmet, adorned with fake water buffalo horns, makes him just as intimidating now as he was several hundred years ago. The general is part of one of the largest private collections of Japanese works of art in the world and is on display at Pointe-a-Calliere, the Montreal Museum of Archaeology and History, courtesy of samurai aficionado Richard Beliveau. ''Samurai: The Prestigious Collection of Richard Beliveau'' presents more than 400 unique items displaying the various facets of the lives of the samurai. Beliveau’s vast collection is exposed to the public for the first time in all its glory: 19 complete suits of armour, 33 masks, 25 helmets and a variety of other masterpieces make up the ensemble of ancient Japanese culture. A well-known figure in Quebec, Beliveau is a collector, university professor, researcher and director of the Molecular Medicine Laboratory. His samurai fascination dates back to when he was 11. He purchased the first item in his collection when he was 15. ''Since then, I have remained captivated by their esthetic sensibility and code of honour,'' he said in an interview. The samurai code — Bushido — has highly influenced Beliveau's private and professional lives. His work as a researcher and his commitment to fight cancer parallels the warrior code of the samurai. ''Cancer is the enemy to beat, and to win it takes imagination, skill and perseverance — values inextricably linked to the samurai spirit,” he said. The pieces he has acquired come from all over the world. Some were bought from museums, like a small ceramic bowl while others were given to him in exchange for his participation in conferences. The incredible condition in which these pieces are maintained beckons the question: how did Beliveau manage to preserve his items in what looks like mint condition, considering some of the objects date as far back as the 13th century? He also clarified that most of the suits of armour come from high-ranking generals who rode horses and were superior warriors, and thus were hit less often. Beliveau doesn't buy just anything. He considers himself a picky collector. ''I only buy items, such as suits of armour, after I've examined a few hundred first,” he said. Beliveau showed off his collection with the enthusiasm of a child and the pride of a loving father, becoming animated whenever he spoke of the history of a piece, or its rarity. A series of red masks, a colour used to show ferocity and intimidate enemies, is part of one of the world’s rarest collections of this particular mask. He also owns a variety of rare swords, some of which are made up of two types of steel, containing both high and low amounts of carbon. This combination makes the blade incredibly sharp. His swords are both flexible, to sustain impact with another blade, and powerful enough to cut through a human body without problem. "Its properties reflect the nature of the samurai," Beliveau said. Francine Lelievre, executive director of the museum, talked about the esthetic quality of the collection as a whole. ''Not only is it an incredible collection, one of the most important in the world, but these are works of art,'' she said. One stunning example of art is a scroll that was painted just seconds before a samurai committed seppuku, or the act of ritual suicide by disembowelment. Beliveau explained that the warrior’s tradition stipulated that one had to prove his hand was still stable, even moments before his death. A book entitled ''Samurai. Exquisite Warriors,'' written by Beliveau, features photos of his collection. The exhibit is presented until March 31, 2013. It is among 20 major events to commemorate the 20th anniversary of Pointe-a-Calliere. If you go:The museum is open Tuesday-Sunday until June 24; it will then also be open on Mondays until Labour Day. Admission is $16 for an adult; $12 for those 65 and over; $9.50 for students between 18 and 25; $9 for students between 13 and 17; $6.50 for children between the ages of six and 12; children five and under get in for free. For a family (one adult and three children, or two adults and two children), the cost is $32. The prices will rise in mid-June because another exhibit will be added. Last edited by David Lewis Smith; 05-21-2012 at 10:54 AM. LONDON.- Bonhams is selling the pistol-sword of Alexander Davison, an intimate friend of Admiral Lord Nelson for 24 years, who subsequently spent time in Newgate Prison for financial irregularity. It will form part of the Antique Arms, Armour and Sporting Gun sale to held at Bonhams Knightsbridge on 25 July. The unusual weapon estimated to sell for £10,000 to £15,000, is a fine and rare flintlock combined 54-bore box-lock over-and-under tap-action pistol and sword made by H.W. Mortimer, London, in the late 18th Century. It bears Birmingham silver hallmarks for 1782, and a maker's mark of Charles Freeth. The pistol has a 64.9 cm sword blade attached. Alexander Davison (1750-1829) first met Horatio Nelson in Quebec in 1782 and he was to remain a constant figure in Nelson's life until 9 January 1806 when, as one of the four principal members of Nelson's household, he broke his white stave of office to be placed on the Admiral's coffin as it was lowered into the vault of St. Pauls', where it remains to this day. Davison was of Scottish ancestry and built a fortune in Canada during the 1770s and 80s as a trader and ship owner during the American War of Independence. On his return to England he was appointed the Commissariat of the Duke of York's army in Flanders augmented in 1795 by his further appointment as agent to the Barrackmaster-General to the British army, General Oliver De Lancey. This was an attempt to rationalize the arrangements individual regiments followed when requisitioning equipment. Davison recovered a fee of 2½% on all purchases, a reward further enhanced when he purchased supplies from his own factories in Millbank and which helped finance the purchase of Swarland Park, Northumberland Following Nelson's victory at the Battle of the Nile in 1798 Davison was appointed, by a unanimous decision of the Captains of the Nile but clearly sponsored by Nelson, sole agent for the sale and distribution of the prizes taken during the battle, As a result of this Davison decided to commission medals for all those who had served in the action at a cost to himself of £2,000 (the equivalent today of about £120,000). He also arranged for the production of the famous crocodile-hilted swords to be commissioned through the Royal goldsmiths Rundell & Bridge for the members of the 'Egyptian Club' established for the Captains who served with Nelson on the Nile. In 1798 Davison acquired a mansion in St. James's Square where in 1800, on Nelson's triumphant return to England, he hosted a banquet in his friend's honour, attended by the Prime Minister, William Pitt, four cabinet ministers and the Prince of Wales. By this time Davison held power of attorney and seems to have been almost entirely responsible for managing Nelson's financial affairs. In 1802 he sought election as member of Parliament for Ilchester, but was jailed for six months in 1804 for electoral fraud. Following Nelson's death on 21 October 1805 the various valuables recovered from the Admiral's effects were examined at Davison's house in St. James's Square. In the presence of Nelson's brother, William, recently ennobled as first Earl Nelson, and William Haslewood, the Admiral's solicitor, both executors of Nelson's will, the various 'Money, Coins in Lord Nelson's Pocket, purse & when killed' were inspected, recorded and then entrusted to Davison as treasurer. Nelson bequeathed his 'turkish scimitar, gun and canteen' to Alexander Davison. In 1807 a parliamentary committee was established to investigate irregularities in the Barrack-Quartermaster's accounts as a result of which Davison stood accused of falsifying purchase orders and receipts. He defended his business arrangements, which old General De Lancey recalled were agreed to insure supplies, and denied any falsifying of documents. However he was found guilty by special jury, ordered to pay £8,800 (about £500,000 today) and sentenced to twenty-one months in Newgate prison. On his release from prison he lived quietly in Brighton until his death on 7 December 1829. It's not even 10:30 in the morning, and I'm already holding an archaic deadly weapon in my hands. I'm in a nondescript warehouse in Seattle, to which I've traveled so that award-winning science fiction novelists can demonstrate how they could cut me in half if they felt like it. Somebody has just pulled a sword out of its scabbard and is passing it around. I'm holding its hilt in both hands, just to make absolutely sure it doesn't slice off something it's not supposed to. It's lighter than I always figured a sword would be. Swords crafted by Portsmouth's Samuel Drowne and Exeter's John Ward Gilman will be auctioned off this week. Gilman's sword features a silver pommel in the shape of lion’s head. it will be auctioned off Thursday at 5 p.m. at the Dover Elks Lodge. New Hampshire-based Leo Legare Auction Services is handling the auction, which will also feature a sword made by Drowne, a Portsmouth silversmith. Several other historical items will be auctioned off. Gilman was a silversmith in Exeter. He is buried at the Winter Street Cemetery in that town. His family played a crucial role in funding the Revolutionary War and rallying citizens to the colonists' cause. Gilman is credited with creating New Hampshire's state seal. Gilman's sword had been in the care a New England family for several generations, according to the auctioneer. Drowne also helped solidify support for the Revolution. How did a Samurai sword forge a 40-year friendship?The ancient weapon links a local veteran of World War II with a family in Japan. On Monday, the U.S.observes V-J Day, commemorating the Allied victory over Japan back in1945. That day, however, means something a little different to 89-year-oldEugene Brams. That's because he holds in his hands a Samuraisword made in 1671. The handle is made of manta-ray skin and pearls. The bladeis steel and still sharp as a razor. It's an implement of death that ended up asthe spoils of war. And a Korean official offered it up to then-Navy Ensign Eugene Brams for helpingsave a clutch of Korean fishing vessels from a fire. "'There are several swords, Samuraiswords, would you like one of those?'" Brams recalled the manasking. "I said I would. Well, he gave it to me with his thanks and Itook it with me and brought it to my ship and carried it back to the stateswhen I was discharged." Sometime later, Brams became curious about theprevious owner of the 300-year-old sword. After all, in Japan, theseweapons are family heirlooms, passed down from father to son. "It was stitched on a piece of silk underneaththe burlap: his name and address, in both English and in Japanese," saidBrams. From his home in Florida, the former Navy man wrote a letteroffering to return the sword. Minori Koyama's reply came a month later,declining the offer this way: "I am so pleased and proud that my sword,my family sword, is in the hands of a great warrior in North Miami Beach." "And I thought to myself, good gracious,"admitted Brams. By then, he was no longer a warrior. He was studyingsoil science and newly married to his sweetheart Patty. But the sword sealed a link between two strangers,sworn enemies of World War II. "It began a 40-year friendship between us, andour families," said Brams. "And as we wrote, he would tell me abouthow his family grew, the beauty of Japan." During those decades, Eugene Brams got to meet Minorionly once in person. Minori Koyama died in 1988. But to this day, one ortwo letters still pass between the two families – united by the sharpestof blades. "It was a link that we kept alive and we'llstill do it," said Eugene Brams. "Because it means a lot to us toknow that we have in Japana family that reveres us as part of theirs." So you can see why Brams has mixed feelings aboutMonday, V-J Day. And that's not even taking into account that it'salso his and Patty's wedding anniversary. Sixty two years, they've been married. And notonce has either one been tempted to use the Samurai sword! If you’re taking a breather from London’s current big event, the Paralympics, which ends Sunday, here’s a little oasis in the heart of the West End: the Wallace Collection, assembled in the 18th and 19th centuries by five generations of one remarkable family. Its 5,470 objects are arranged in 25 galleries within the Hertford House, a lavish but not intimidating home. Unlike its sister national museums, the Wallace has a charm born of intimacy. In a notation in a visitors book in 1878, Benjamin Disraeli called it “this palace of genius, fancy and taste,” which captures its magic. As you step back in to a more leisured, gentler age, you can see an extraordinary array of 18th century art — furniture, porcelain and gold snuffboxes as well as paintings by Watteau, Boucher and Fronard. You’ll find some of the greatest names in European art, as well -- Titian, Canaletto, Rembrandt, Rubens, Velázquez and Gainsborough -- and superb medieval and Renaissance objects, including Limoges enamels, majolica, glass and bronzes. If all the beauty becomes too much, you can veer off into the Noble Art of the Sword, an exhibit on the artistic and cultural importance of the sword, as a symbol of power and prestige, as a flamboyant fashion statement, and as an icon of the Age of Discovery. The exhibit continues until Sept. 16. The museum is free and open 10 a.m.-5 p.m. every day except Dec. 24-26. Info: The Wallace Collection, Manchester Square, Greater London W1U 3BN. The Wallace is an absolutely fantastic place. I've been there twice. If you can't go there, search online for their catalog: Wallace Collection: European Arms and Armor in two volumes. Anyone else see the article on the sword forged from a meteorite? (link). Doubt it's very sturdy for actual use but it's an awesome idea!